ManEcho’s approach is a pragmatic one; it is centred on the operational dimension and on speed of execution. From the very outset of the assignment, our team of consultants acts with total and sustained focus on the transfer of skills and the sharing of know-how. The key actors in the transformation are brought together on a Steering Committee, coordinated by ManEcho, its remit being to guarantee delivery of the expected outcomes within the set timeframes and to ensure the long-term efficacy of the results achieved. 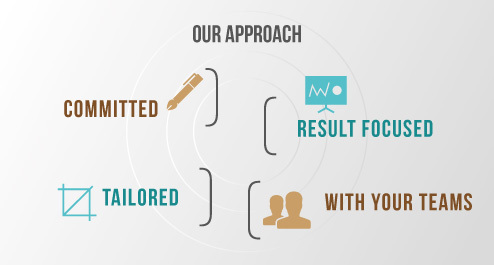 We have developed a structured and dynamic methodology of approach in order to promote cross-company transversality and to speed up decision making. Alongside the management, ManEcho establishes the roadmap and ensures the success of the action plans.